No little creatures need to cry." We think that’s a drongo looking out for insects disturbed by the giraffe. Well observed, Gracie. Celine lives in Meru, Kenya. "I love giraffes," she says, "because they’re tall and friendly like my dad." Thank you, Celine, for starting our collection with style. Dennis is Gracie’s brother. 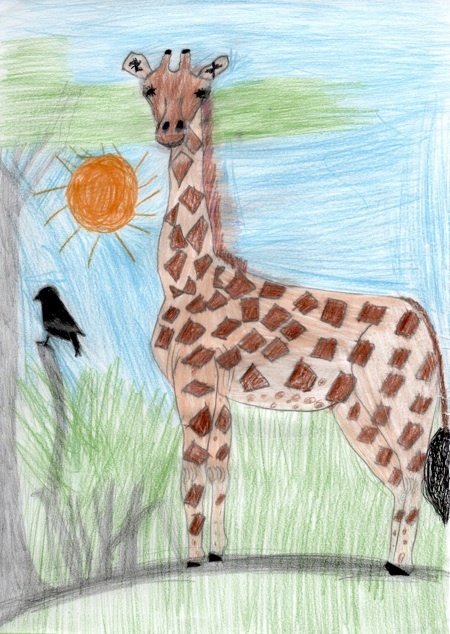 He also sent us a poem: "I drew the baby giraffe / Because he's little same as me / Like my watchful Mama / Above his head beside her knee / Stands his gentle caring mother / Like Mama and me they love each other." You’ve drawn the calf’s reticulations beautifully, Dennis. Well done. 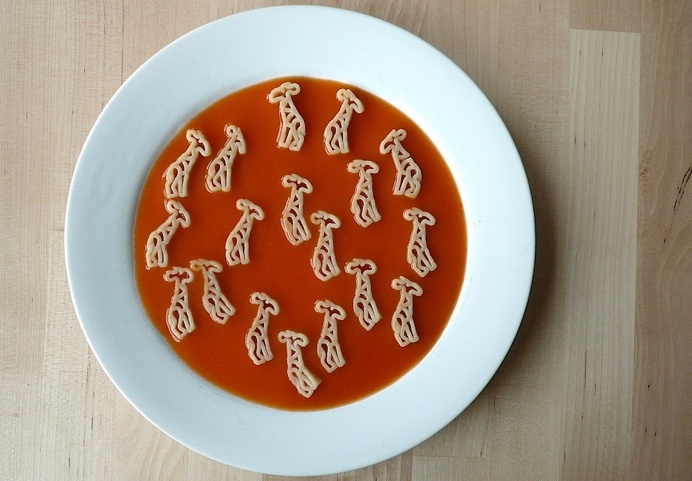 "Giraffes, tomatoes and pasta are three of my favourite things," writes Ann-Helén from Oslo, Norway. "Next, I’m going to make some grey soup and send a picture to Save The Elephants." Thank you, Ann-Helén. We hope that no one complained to the waiter. 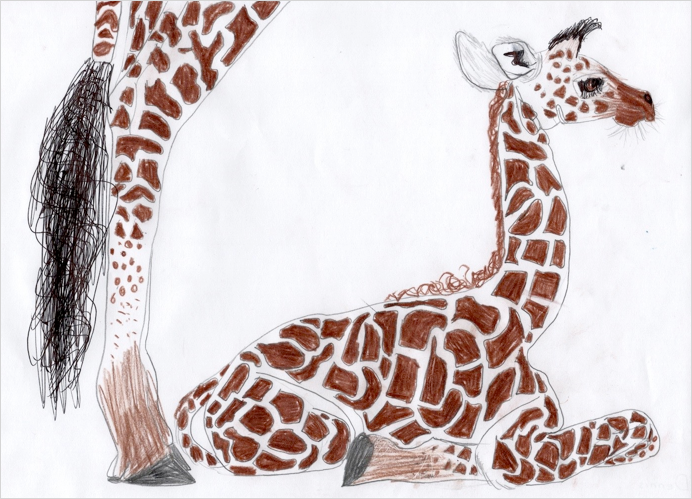 Aymeric's mother writes from Huningue, France: "Together with his little sister Elise, Aymeric has drawn one flowered and one striped giraffe to support the Reticulated Giraffe Project. 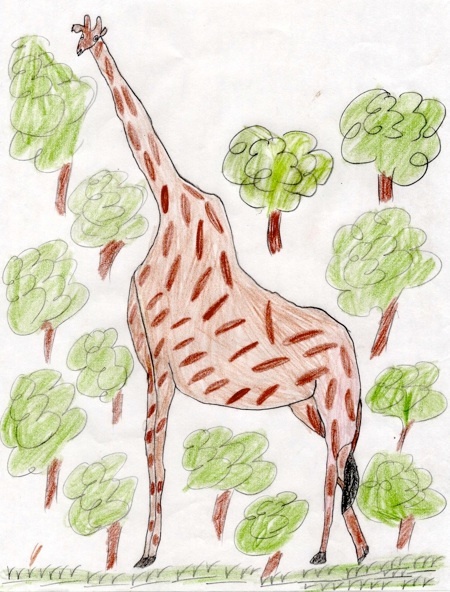 The flowered giraffe is eating leaves from a tree, not far from a bee's nest. These are unusual giraffes but they look very happy." We love your drawings, Aymeric and Elise. The one with the bee's nest reminds us of the 'Kirikou' films. 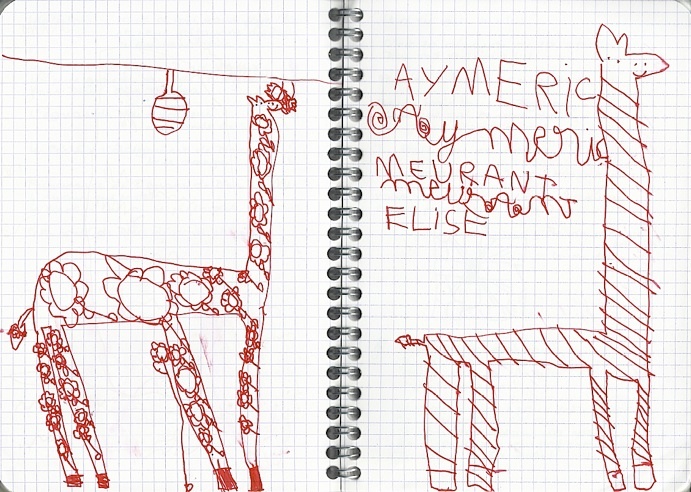 La mère de Aymeric écrit de Huningue, France: "Aymeric a dessiné avec sa petite soeur Elise une girafe à fleurs et une girafe lignée pour soutenir le Projet de Girafe Réticulée. La girafe à fleurs mange les feuilles d'un arbre, non loin d'un nid d'abeilles. Ce sont des girafes originales qui semblent très heureuses." Nous aimons vos dessins, Aymeric et Elise. Celui avec le nid d'abeilles nous rappelle les films de 'Kirikou'. 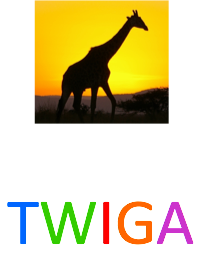 Please send us your picture of a giraffe or of any other African animal (made using pencils, paint, fabric, pastry, sand, snow or anything else you like) and tell us in a few words what your chosen subject means to you. We’ll keep your pictures in our collection and we’ll put our favourites here (newest first) for all the world to see. You can contact us at this address but please send scanned or photographed images to this address (or by Dropbox). Thank you.